This is the fourth theme of a series of seven. We’ve developed these to help us decide on the future direction of the Mozilla brand, and now we want your thoughts as well. Does this reflect what Mozilla promises to the world? Does this reinforce the experiences and values Mozilla delivers? Does this communicate the ‘right’ image to the world? Please use the comments below to let us know what you think. * The images you see on these boards are for illustrative purposes only. Don’t take offense if we’ve used an image of your company or project – please be flattered. This is a friendlier direction and think stands for Mozillas principles of helping and making the web for all and freeing it. We believe that a more accessible internet that empowers people will contribute to making the world more connected and promote freedom. 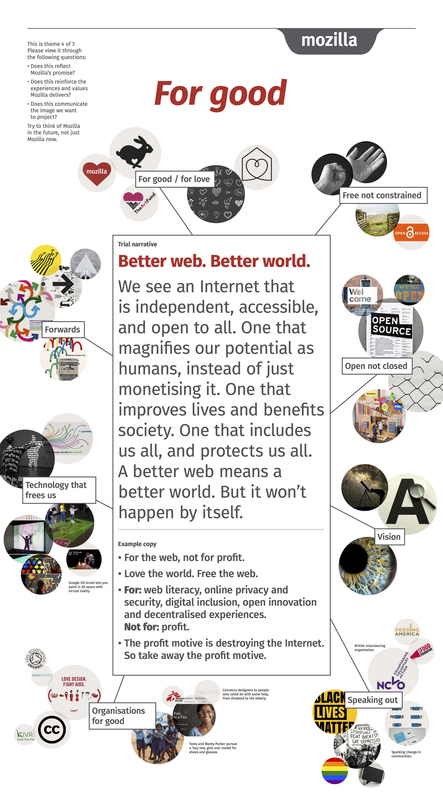 Is “A better web means a better world.” provocative and energizing enough to engage new audiences? I’ve looked over all 7 brand ideas (2 or 3 times) and this appeals to me the most because it uses a positive message to convey it’s ideas. This one is more like “glass half full” rather than “half empty”. Although no individuals or personalities were included in this to reinforce the brand, it’s easy to associate “For Good” to people like Ghandi, Martin Luther King and Barrack Obama. These are people that wanted change but usually spoke about it in a positive manner (or at least that how I remember them). Their most famous quotes talk more about their dreams of good bright futures than focusing on the bad of today. The only thing I don’t completely agree with in this positioning is… “The profit motive is destroying the Internet. So take away the profit motive.” This isn’t a positive twist like the rest of the positioning. We also can’t forget that profit helped build the web. I think a more positive tone can be used to address this point. For example, “freedom over profit” or “Free web for all, not just for some” or “A free web profits everyone”. Great job on these 7 incredible brand and positioning ideas. I love that you “open sourced” it. Thanks, Alex. Your citations around hope, optimism and human potential suggest a more positive future orientation for Mozilla. Thanks for articulating that path. You are not alone in sharing that feedback with us and we’re absorbing it and doing some rethinking as a result. Great thinking! I agree with Alex – this one resonates with me the most. To me, the underlying message is very similar to other proposals but this one goes about it in a more positive, “the future is bright” kind of way. Thanks, Tiffanie. Another voice for optimism. And bits of this message can veer close to the boundary of what I can deal with on the super-saccharine side. Love and rainbows and such; it’s a little over the top. But we need to keep in mind, as I’ve alluded to on other themes, that not everyone is an activist. Not everyone cares about the same ideals. So we need to be careful about what we choose to make a big deal of. I do want to caution again about being very careful with what people and groups you choose to reflect your ideals. For example, I’ve seen imagery of President Obama in a few places on these themes, representing hope and change and such. But not everyone sees him that way; to other people he’s more a symbol of wishy-washy, ineffective leadership. Similarly, Ronald Reagan might be seen as an example of strength and leadership by some while to others he might represent carelessness and wastefulness. 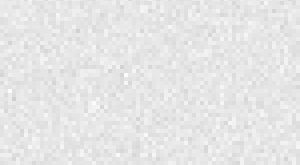 Different people will react different ways to these images, and given how polarizing politics can be, there’s far too much risk of annoying a disproportionately large percentage of possible users. So please, please be careful. Thanks, Eric. Good point. We have yet to dig into the political associations of the American portion of our target audience, so we have no idea whether Obama or Reagan or someone else would be a positive influence on their appeal and understanding of Mozilla. Regardless, using U.S. politicians to shorthand certain values is not a great way to communicate to a global audience. We’ll likely stay away from individual politicians in our final brand identity. As the Mozilla Developer Network says: “Shared knowledge for the Open Web”. I am conviced by the idea of helping other people because I can do something good for them and not because I want to demand something in return. This slogan inspires me and I think that it is Mozilla’s core idea. Thanks, Philipp — both for your well-considered suggestion and your contribution to MDN. Your awareness of Mozilla’s role in developing new open-source technologies extends further than the average person, who may think that Mozilla is just another tech startup motivated by profit. Love your emphasis on “together.” Many people who use the Internet are unaware of the trade-offs they are making for the content they desire. To them, the Web doesn’t need to get better; it works just fine as it is. How important is it for Mozilla to educate those people about what’s good and bad about today’s Internet first, before we can ask them to be a part of the “together” we envision? This one feels pretty abstract to me. 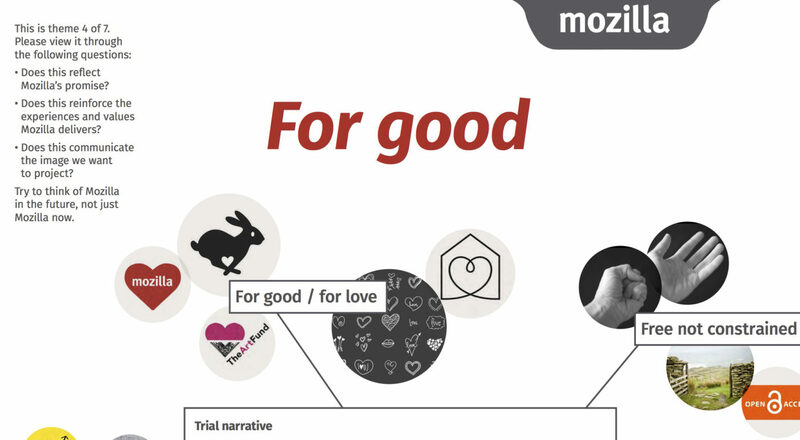 However, I’d not go for branding Mozilla as “good”. Like commented on other brand suggestions here on the blog, the same thing or person might got interpreted differently by different people. Obama was mentioned. As a contributor to Mozilla (through SUMO), this brand identity is the one that I connect with the most. Whilst we may be engaged in many different facets of the community, we are all connected by our desire to do what is right and what is good for the web, and the wider community of users and fellow Mozillians we interact with. Sure, different people will have different ideas of what is defined as “good”, and that will differ according to context, but it will be generally reflected by the themes identified in the diagram above. What I really like about this idea is that it has a level of flexibility compared to some of the more aggressive postures taken by some of the other ideas. Whilst I agree that they form part of the Mozilla manifesto and that we should take an interest in them, I always feel a bit concerned when there is focus on privacy and the “surveillance state”, as these views can make us look a bit of a anti-government fringe outfit, which could alienate us. Yes, we would have to be careful with this brand (just look at Google with its “do no evil” approach! ), but I think that this option sums up for me what Mozilla (and open source more generally) is all about. Whilst I fully appreciate that this process to build a new brand identity is a collaborative process of many parts, I appreciate the opportunity to contribute and am grateful of how it has crystallized my opinion of what we do at Mozilla. Regardless of the final result, “For Good” is how I see what we do making the web open and free for all. Thanks for sending positive energy in this direction. For Good indeed.